Salsa is one of the most popular dances around the world. 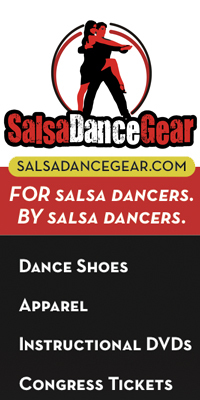 Salsa dance shoes are a must have, for both social and professional dancing. With other words, salsa dancing starts with a good pair of salsa shoes. Salsa shoes are made especially for this type of dance. Wearing these shoes makes a huge difference when dancing salsa all night long. For salsa dancing classes you do not need any specific type of dance wear. But it is definitely advisable for the women to start dancing on high heels in an early stage. Getting used to dancing on high heels in an early stage will prevent you from having to learn to dance all over again in a later stage, because dancing on high heels is a challenge on its own. The cheaper pairs of salsa shoes are perfect for beginners. For advanced salsa classes that require more spinning, salsa shoes with special soles meant for spinning are a must. These shoes are made with a thin leather or suede sole. These salsa shoes are not to be worn outside. Dirt and water will ruin the shoe. Your salsa shoes should only be worn indoors! These types of shoes have a great fit unlike other shoes. They are slightly tighter than regular street shoes, and should be in contact with all parts of the foot. If the foot constantly slips out of the shoes, the dancer cannot maintain her balance and grace. Last but not least, the female salsa shoes in general are very elegant and flamboyant. So, choose your salsa shoes carefully. They will add to your enjoyment on the dance floor. From 'Salsa Dance Shoes' back to 'Salsa Dance Clothes'.